>Nearing the end of our count-down of CineKink trailers redux, we’d be most remiss to overlook these petticoated crowd-pleasers! From CineKink NYC 2006, again our many thanks to on-screen phenoms – Sissy Carol, Sissy Stephanie and Sissy Terri – and to the editorial genius, Steve Ovenden, for bringing our tender creative visions into such vivid existence. And perhaps at CineKink NYC 2008, a chance to see the Sissies again – but this time as celebrities in our midst? >Would you like some pizza, little girl? >Many thanks to everyone who braved the wind chill and came out for our premiere screening party at Pioneer Theater. Hot kink and hot pizza! 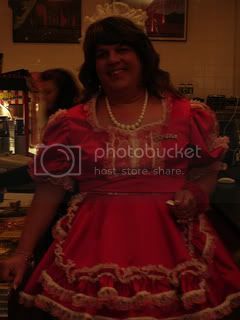 We were graced with the presence of a sissy gone merely semi-wild, Sissy Stephanie, which may be her weekday mode. And friends old and new packing the house. Since it was soooo very cold, we spent extra time in the lobby, waiting for folks to arrive.